Welcome to the Very Special Earth Day Edition of Waiting for Wednesday! On today's show, we'll feature an all-new, all-different...wait...no, we won't. Hmmm...maybe we should do something for Earth Day--like a paperless edition of Waiting for! That would be a great idea. Unfortunately, I don't really read that many Web comics. I know, I know. For shame. But, hang on a sec--we've already covered the topic of online comics in a post from WAY back in the early days of Exfanding (last September), and you can check that out right here. A little nostalgia for all your paperless, Earth Day needs. Anyway, on to this week's (paper-rific) Waiting for! 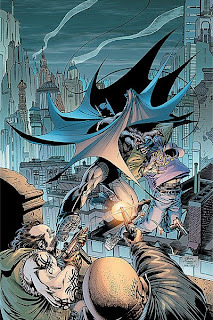 First up is Detective Comics, issue 853. I know what you're thinking--yeahbuhwha?! Is Alex actually endorsing a mainstream DC book? Yes. Yes, I am. And with good reason, too. This issue contains part two of Neil Gaiman and Andy Kubert's highly anticipated (and, sadly, delayed by a month or two) "final" Batman story. Oh, and just as a warning, the following contains some minor spoilers. This second part of Neil Gaiman and Andy Kubert's special collaboration is sure to be a BATMAN story for the ages. This extraordinary tale, told as only Gaiman and Kubert can, explores the intricate relationships between Bruce Wayne and his friends and adversaries and builds toward an exciting and unexpected climax. It's a classic in the making. Uhm...okay, well, despite DC's all-caps BATMAN and a painfully vague...uhm...let's call it a "preview"...of the story, this book is certainly worth your time and your hard-earned pocket change. Even if it's not exactly "pocket change" anymore. I loved the first issue of this story, which saw Batman's friends and enemies line up at the Dark Knight's funeral. Now, I don't want to say much else about it, because I really think you should check this book out, if you even have a passing interest in the Batman mythos. But I will give you this much...Gorgeous Kubert cover? And, of course, it's written by Neil Gaiman, so the story is entertaining and mysterious and thought-provoking. So, check it out, and if you missed the first issue, DC went back to press with it, so there should be plenty of copies available at your LCS. Now, the reason I am recommending this book is mostly because of how great the previous issue of this series was. Honestly, the Justice League runs hot and cold with me--I have no burning desire to read stories concerning the entire line-up of characters, as I'm partial to Batman and...well, Batman. So, it's more about the creative team on the book that determines whether I'll pick up an issue or not. Every once in a while, I'll buy the book if the cover looks good, or if the story seems intriguing. I read (and loved) many of the issues written by Brad Meltzer and drawn by Ed Benes a couple of years ago, but I fell off the JLA wagon after they left the book. I have read a few of the Dwayne McDuffie issues, and I'm a fan of his writing and of his work on the title. Like I said, though, a JLA issue just has to grab me before I'll take a chance on it. I just find that image to be flat-out striking, so I threw the book onto my pile and geared up for a good League story. When I read the issue, I was pleasantly surprised to find not only a good JLA tale, but a great one. Writer Dwayne McDuffie and artist Shane Davis really delivered the goods here. Last issue saw the team dealing with the fallout of DC's mega-event, Final Crisis. After that mini, things just aren't the same for the Justice League, as Green Lantern has set out to start his own team, while Black Canary is still trying to run the "main" team. As I've said, I need to go back and re-read Final Crisis to figure out what actually happened. 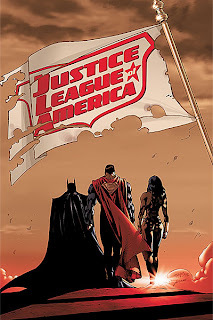 Still, all you'll need to know going into issue 31 is that the League is experiencing division in its ranks. And McDuffie and Davis give you everything else. Last issue had GREAT characterization and just a really interesting story about what the League will do when faced with these current challenges. 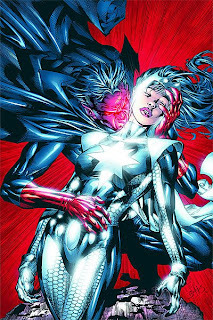 While the team struggles with the aftermath of dissolution, the cosmic force known as Starbreaker sets out to ravage the earth for a hidden source of unimaginable power. But with the team facing its own crisis, who will stand in his way? Now, I don't know who Starbreaker is, but hopefully that won't matter. Also, this issue is not drawn by Shane Davis, but it's Federico Dallocchio. I'm not familiar with his work, so I look forward to checking it out, and here's hoping that JLA will be a regular monthly purchase for me from now on. Well sir or madam, that's it for me today--just two books and neither are from Marvel...or from some indie publisher no one's ever heard of. So, from this day forth, it can never be said that I don't have love for DC! Now on to the important question: what are you Waiting for? I went to Timeless today to pick up issue #2 of Gaiman's Batman, and found out he didn't even have enough copies to make it through Wednesday, let alone the rest of the week. Now I'll have to wait until at least next week to get it. Oh, and I highly recommend Ythaq. It's a French comic by Soliel that is being translated and marketed in the USA by Marvel. It's a great blend of anime-esque science fiction and fantasy, with an in-depth plot and surprisingly likable characters. They just finished a 3-part miniseries, and will release a second mini-series starting next week. When I got there Wednesday afternoon, he had put one aside for me and there were none left on the racks. He should have them in this weekend, though. It's a good thing when comics sell out, especially in this economy, but I know how it is when I can't get a book I really want! I've seen Ythaq on the shelves, and for whatever reason never picked it up. I guess I figured there was a huge prior continuity to the story--is that the case?